My brother and I started taking/processing HDR photography in 2008. At that time the editing technology was in its infancy, and digital DSLRs were only just starting to catch on. One of our initial inspirations was the (really really talented) Trey Ratcliff of StuckInCustoms.com – amazing photographs and even more amazing travel destinations. Now that I have been all over the world, and know many more professional photographers in the travel genre, I have shot at many of the same locations. I always enjoy comparing my work to the pros. Sometimes theirs is hands down better, and sometimes I like mine more. One of the things I have realized over the last few years, after watching and even meeting with these pros, is how much effort goes into their brand. Yes, I can take some damn good pictures, maybe even some better ones, but no one really cares… unless you spend LOTS of time promoting it. Looking all the best pro photogs in this genre (digitally blended travel/landscape), they are all great marketers- Trey has TONS of G+ followers and does almost daily webcasts, Elia Locardi (http://www.blamethemonkey.com) does photo tours around the world, and Daniel Cheong (http://www.danielcheongphotography.com), has huge numbers of followers on Flikr and 500px. All of these pros, and all the other good ones, spend as much or more time marketing, networking and promoting their works as they do shooting. Getting to that critical mass of social followers and name recognition is really hard, and that is what really separates the amateurs and pros. 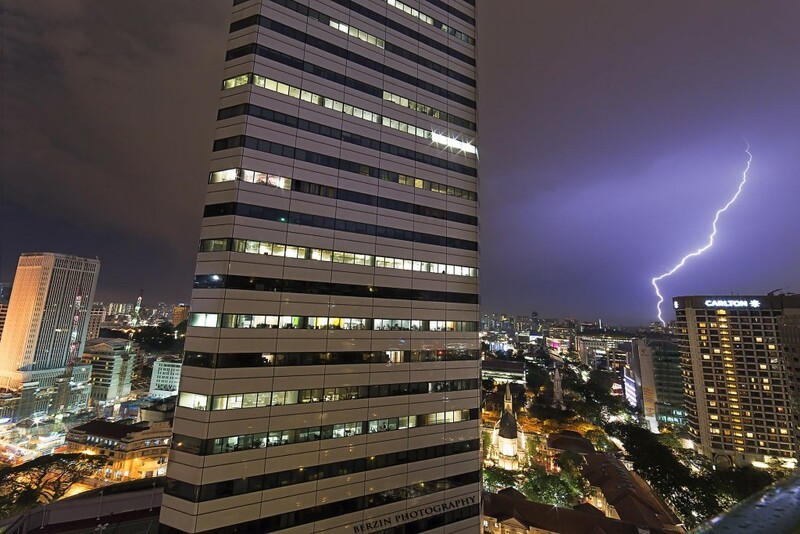 As mentioned, Daniel Cheong is a great photographer (and editor). With 56,000 plus Facebook followers, he’s (not surprisingly) very popular as well. 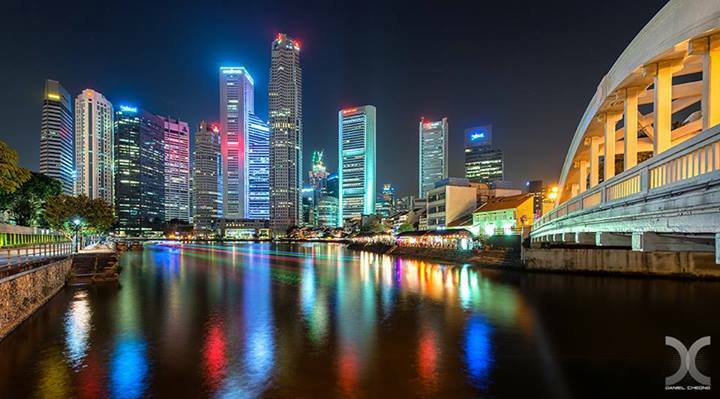 In the last week or so he has posted a number of pictures on his websites of Singapore. Since he’s sharing, I figured I could share some of my shots from similar locations! 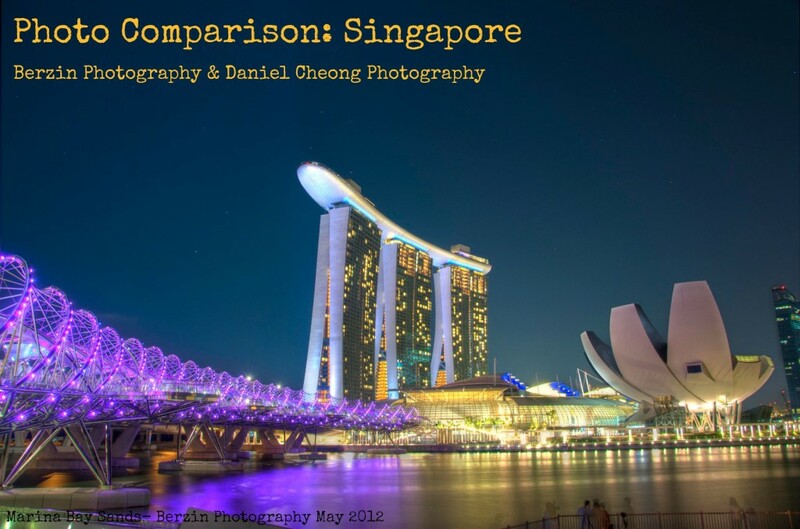 Here we have Daniel Cheong’s Singapore River picture on the left, and mine on the right. It looks like I used a faster shutter (no glassy, blurred water), and was later at night (blacker, not blue sky). I usually enjoy his shots, but this processing / color saturation is a bit too trippy for me. As you can see here- My lightening shot is no where near as good. At the time I was just happy I devised a method to accurately capture the flashes. 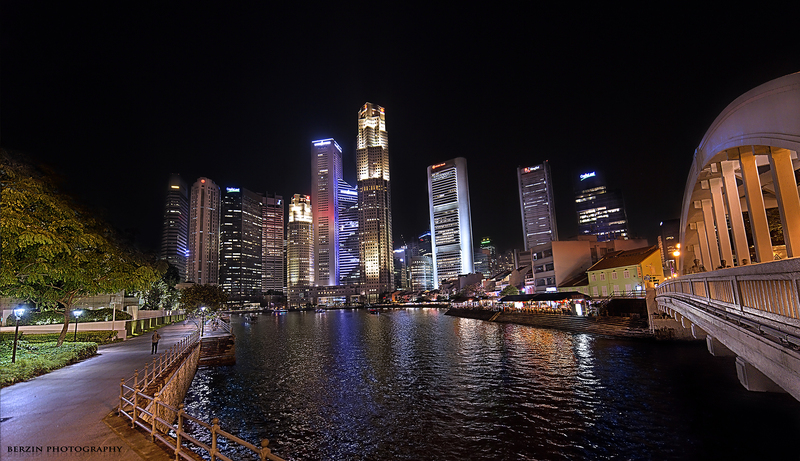 We both also managed to get some pics of the harbor and Marina Bay Sands’ light show. I was staying at the Farimont when shooting these in April 2013, and it looks like Mr. Cheong shot from the adjacent SwissHotel. Slightly different perspective, in terms of height, focal length, and field of view, but generally similar. This picture really shows Cheong’s great editing skills- really green laser highlights, the long exposure to streak the headlights on the road, and all while maintaining a smooth black sky! I have a few other sets of the light show that I will need to put some work into. Hopefully it’s interesting to see the difference between good and great, I think it was fun to compare. Mr. Cheong has some serious skillz. I will have to do a few more of these with other pros/locations in the future! Leave a comment below and tell me what you think.